Welcome on the website of the Via Ferrata del Cabirol! In this pages you can find all the necessary information to reach and safely climb along this fabylous itinerary along the high and dizzy cliffs of Capo Caccia, Alghero. You can decide to climb the via ferrata with a guided tour, or independently or even just rent a kit. For those who want to climb another via ferrata in this area, please note that there are two more via ferrata: the Via Ferrata di Giorré (Cargeghe) and the Via Ferrata della Regina (Monteleone Rocca Doria). To climb the Via Ferrata del Cabirol isn’t a simple tour, it’s something more, is a unique experience, exciting, amazing, unforgettable. These are the words spoken by those who have climb it, whether they were beginners or super-experts. The Via Ferrata del Cabirol isn’t a mountaineering tour, in fact, despite being used harness and other mountaineering materials, this is classificable as for “expert hikers”. 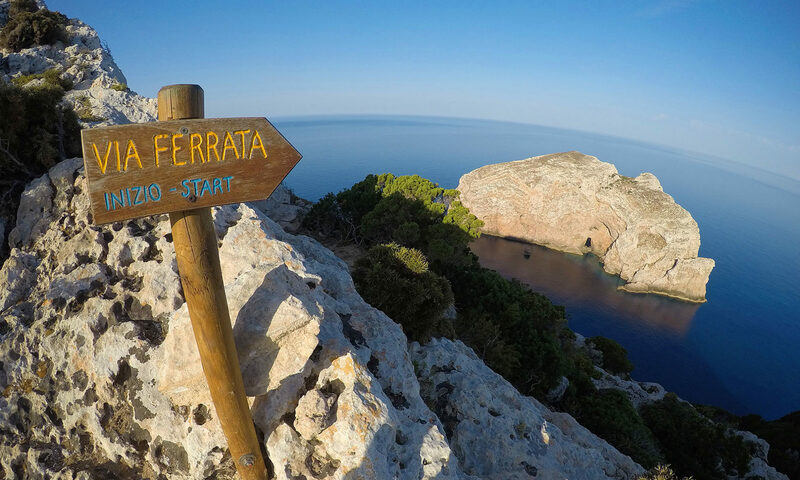 You can take part in a guided tour on the via ferrata booking the chosen date in time or joining one of the dates already set. All participants will be provided with the technical equipment ad with a initia briefing will provide all the information to safely climb this itinerary. Via Ferrata excursions are guided by Corrado Conca, long experience hiking guide.